Who We Are. Why We Rock. Other Stuff. G.O. stands for Giro Okanagan (Giro is Italian for "tour"). It's the single day version of our extended Giro Okanagan Cycling Vacations. Giro is a new concept in cycling tourism for BC: Exceptional cycling and an immersive introduction to the Okanagan (Find our more about Giro's multi-day vacation packages at www.girookanagan.com). With G.O., we offer a carefully curated one-day experience that explores our region in a unique way, providing an intimate view of one of the world's most beautiful Valleys. I've been seriously cycling now for over 20 years. In that time, I've been fortunate to do some spectacular riding in almost every corner of the world. But some of the best riding I've ever done is in my back yard - literally. The Okanagan is an amazing place to explore on two wheels. After running a successful digital marketing agency for several years, I decided on a complete change of pace and started G.O. Experiences (and our multi-day cycling vacation sister company - Giro Okanagan). But this wasn't just about creating a cycling tour company. This was about distilling everything I love about this Valley into some very distinctive and personal experiences - the people, the places, the products and - of course - the cycling. Our guides and hosts love two things: cycling and this Valley. Our tour guides are selected from a host of local cyclists. The roads you'll explore are the roads we ride all the time. Along the way, we'll show you experiences that most visitors would never discover. Our themed tours often feature guest hosts that love to share their expertise: a local historian and artist who has been collecting stories for his entire life, a railway engineer who will explain the miracle of the Kettle Valley Railway and Myra Canyon, a award-winning winemaker who will unpack the complexities of our local grapes, a renowned chef who take you to his favourite sources for local farm-to-table produce. This is a company built by cyclists for cyclists. So we obsess about things like rider safety, providing pleasing routes, supplying you with a great bike and, if you're up for it, challenging you a little. We know - and you know - that there's nothing like a great ride. So you'll find our experiences always put riding front and center. While we offer a good range of riding options for most levels of cyclists, if you seldom ride, these are probably not the right tours for you. There will be some traffic and there will be some hills to climb. So, for me (this is Gord talking here), things like User Experience and Experience Design were my life for several years. It's how I made my living when I worked in digital marketing. And old habits die hard. The good news for you, as a G.O. Guest, is that I can be a little obsessive about the quality of your experience. I'm constantly introducing new elements and tweaking things in the quest for that "WOW" from you when you book one of our Experiences (my kids call it the "Gord" stamp of approval). I can't help it. When we were creating our experiences we thought about all the amazing tours we've been on, whether we've been on a bike, walking or on a tour bus and we realized something - they all had one thing in common. They all had great guides leading them. That's what made the difference. People who had interesting stories to tell, who shared their own life experiences, who were passionate about the experiences they were introducing to their guests. So that's where we started with our G.O. Cycling Experiences. They're a little different than your ordinary bike tour because our team is anything but ordinary. Our Guides are all local residents and ardent cyclists. And we were amazed with who came forward. Retired business people, doctors, engineers, journalists, teachers, bird watchers, artists, winemakers, world class amateur athletes, nurses - this could be the most interesting group of people you've ever met! Our Hosts will Introduce You to an Okanagan Experience Most Visitors Never See. 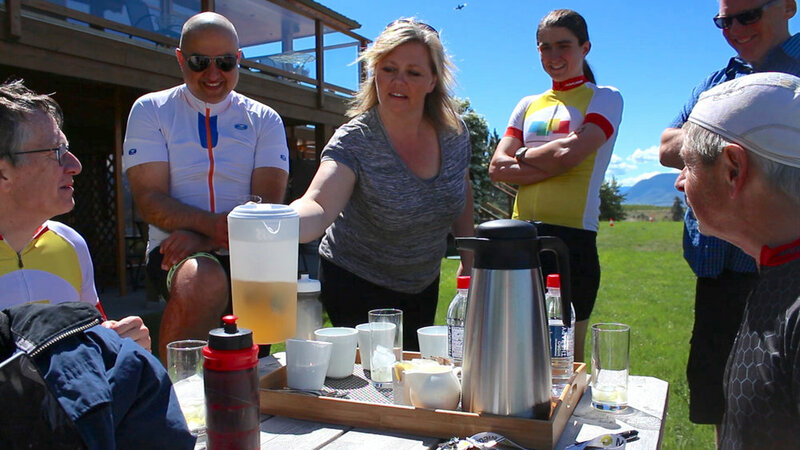 Many of our Experiences (especially the Cycle and Savour packages) have a guide and host. Having lived, worked and raised a family here for over 30 years, we've met a lot of really interesting people who have know this Valley like the back of their hand. So, when we visit a farm that grows fresh Okanagan produce, a chef who uses that produce will explain exactly what farm-to-table means. 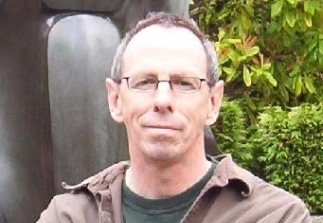 A local historian will tell you about the history of Kelowna. A winemaker will show you what to look for on the vine. A railroad engineer will point out the hardships overcome in completing the Kettle Valley Railway through Myra Canyon. Great experiences don't just happen. They have to be carefully planned. We work tirelessly to make sure your day with us meets all your expectations. That means that we'll have your back every minute, over every kilometer. When the day's activities require transportation for you and your bike, we'll be there with G.O. 's own shuttle. 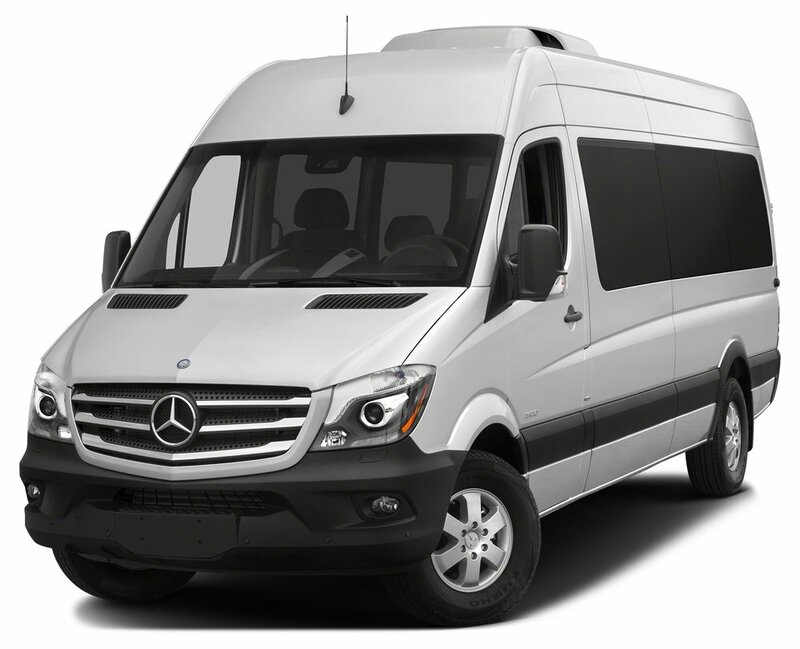 A Mercedes Sprinter 2500 Shuttle that can carry up to 11 riders and their bikes in style, this is the next best thing to riding! For larger groups, we can make arrangements for larger shuttles or buses. All our bikes are maintained by certified bike mechanics (we partner with VeloFix in Kelowna and the Bike Barn in Penticton). Each bike has spare tubes and a pump as well as basic tools. If you have a minor mishap on the road, our guides will help you get rolling again. For more serious repairs, the G.O. Support vehicle will swap for a new bike (if available). From start to finish, we work to ensure this will be a great ride for you. We begin with a a safety check of you and your bike. We then do pre-ride briefing to cover the route, some basic safety tips and other particulars. While you're on the road, we'll cover you with our support vehicle - picking up any purchases you might make, providing snacks or drinks and helping with any requests you might have. We'll also meet you on the road at designated rest stops with some Okanagan grown delicacies. A Great Ride Starts with a Good Bike! It's pretty simple math: Bike + Experience = Your Satisfaction. The Bike is at least half of that equation. So our bikes don't cut corners. They're built for comfort, reliability and performance. We trust Trek to deliver on the roads and trails we've chosen. Whether it's our premium carbon road bikes or our trusty hybrids - you'll ride easy knowing your bike will make your cycling experience that much better. Trek's Domane 5 Series was developed for Fabian Cancellara to crush the cobbles of Europe. Turns out the things he wanted—speed, efficiency and comfort with zero compromise in weight or performance—are things we all want. Handmade from 500 Series OCLV Carbon, it's light and stiff, and with genius ideas like their IsoZone tech, it's oh so compliant too. Race-all-day geometry gives you the edge over the competition with confidence-inspiring handling while the specs keep you at the front of the peloton. An Ultegra drivetrain with compact cranks dishes out the silky shifting that Shimano is renowned for and Bontrager's tubeless-ready wheels are wrapped with 25c tires for the perfect combination of speed, low-rolling resistance and ride quality. 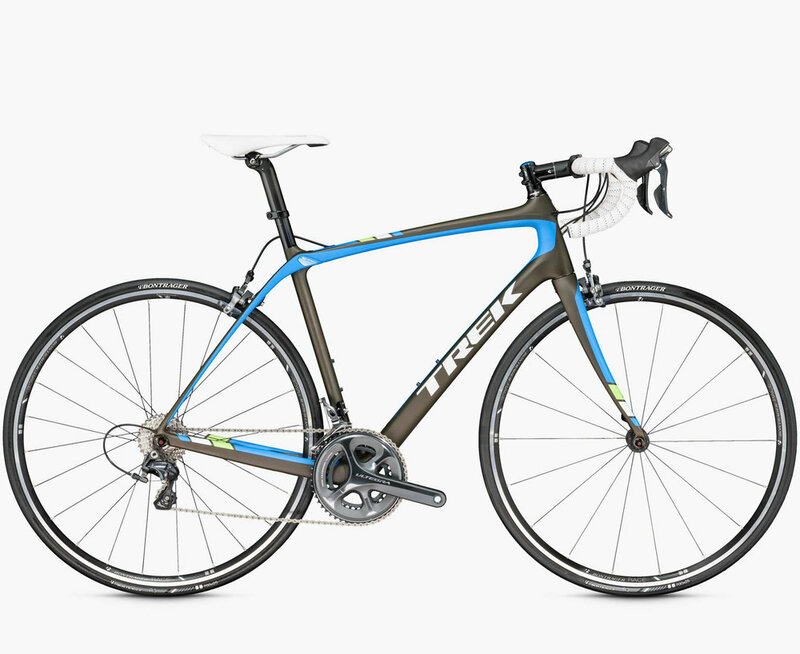 Trek also keeps the 5.2 firmly in the featherweight class with a carbon handlebar, seatmast and fork. Trek's 8.5 DS is the one bike for all your commuting and general riding needs. The DS's Gold aluminum frame and the SunTour suspension fork ensure a smooth ride and nimble handling over even the most potholed roads and bumpiest paths. The large 700c wheels with multi-surface Bontrager tires roll over obstacles easy for a fast, stable ride. This do-it-all ride also boasts a 27-speed Shimano drivetrain for sweet shifting while the Bontrager saddle and bars ensure complete comfort no matter how long you ride. Plus, you'll always cruise with confidence knowing that disc brakes are at the ready. Ride it on the road, ride it on bike paths, no matter where you ride, you'll have fun! With every group we take the opportunity to hand-craft an experience just for you. Because these are custom experiences we can tailor each one for the group with enough advance notice. Add a meal. Tweak a route. Suggest a destination. Ask us for our input. Then let us take care of putting it all together! We've outlined some incredible cycling experiences in the Central and South Okanagan, but we're happy to go "off-script" and customize something specifically for your group. We can create something amazing for any group of 3 or more riders. When you book we'll be in touch to find out more about the group and what you'd like to explore. We do need some advance notice for customization though! Our G.O. Shuttle can provide transportation for groups up to 11 people (including their bikes). If you need a pick up from your hotel, conference center or anywhere else in the Okanagan let us know and we'll quote you a rate. We work with a number of partners throughout the Okanagan, including restaurants, hotels, wineries and tourism experience providers. This allows us to hand craft each G.O. Experience to highlight the best the Okanagan has to offer. Coming to the Okanagan on business? Let us add some pleasure. Take a break from the meeting room and do some 2 wheeled exploration. We'll work around your schedule to give your group an amazing break from the laptops and whiteboards. Like the Idea of a G.O. Experience? Try an Entire Vacation!